1.) SALLY! She's so grown-up and I adore her little gloves. 2.) Betty is back in shape and as stunning as ever. 3.) Love Megan's late-60s hair and dress. Also: Her makeup! 4.) Don's looking as dapper (and yet concerned) as ever. Love a man in a bowtie. 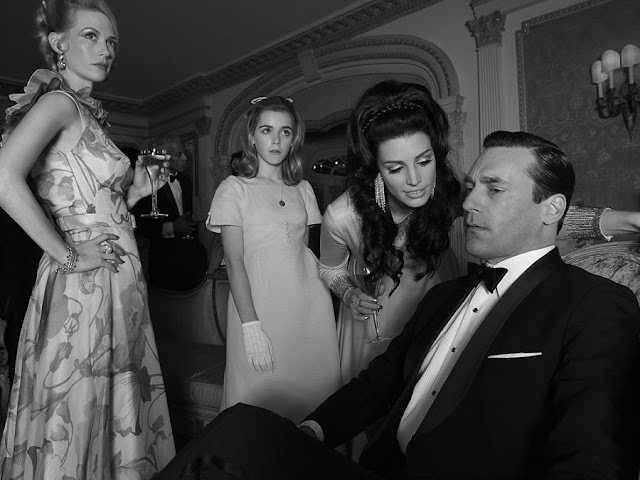 So, you're probably going to a Mad Men party come April. 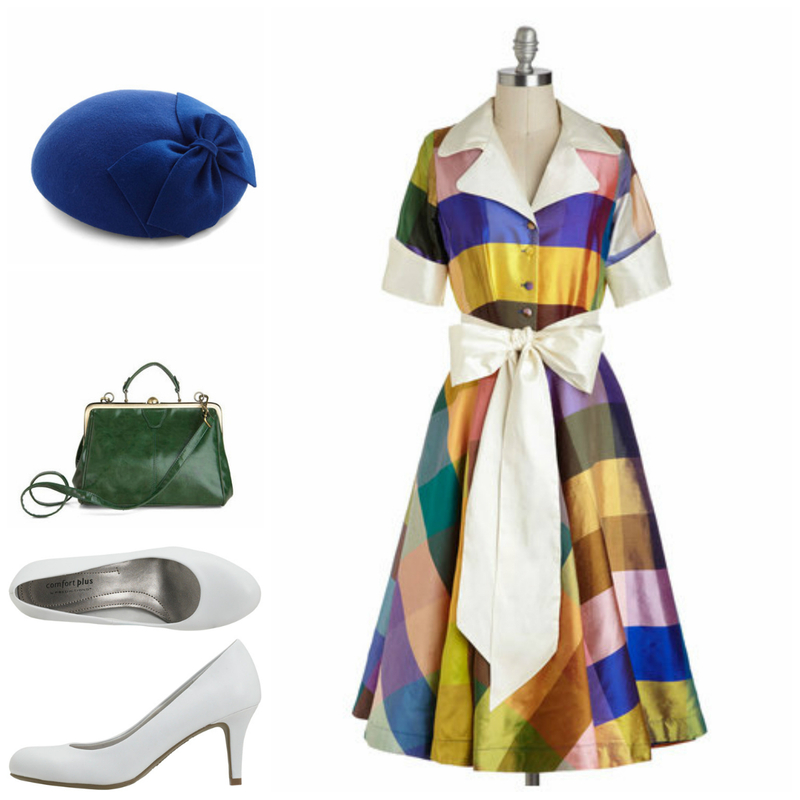 Would you go as Betty, Peggy, Megan, or Joan? They all have distinctly different styles. If you're like me, you don't want to wait until April to find the perfect outfit. You want it now. You want it hanging in your closet. No, actually, if you're really like me, you'd probably hang it on the outside of the closet door so you can admire it for the next few months. Here are some outfits to consider, complete with vintage-style dresses, low heels, pearls, gloves, hats, and handbags! Sophisticated but girly, and a little bit more fancy. Try a floral gown with pretty pearls, embellished gloves, and pink heels. More conservative and working-girl, but we've seen Peggy's style evolve and grow. This outfit is perfect for going to mass with her family. Very trendy and smoldering, Megan steals the show with her youthful, modern style. Joan shows off her lovely curves in tight satin, and often wears red and red lipstick, even as a redhead. What would Joan be without an embellished secretary pen necklace, even though she's now a partner? 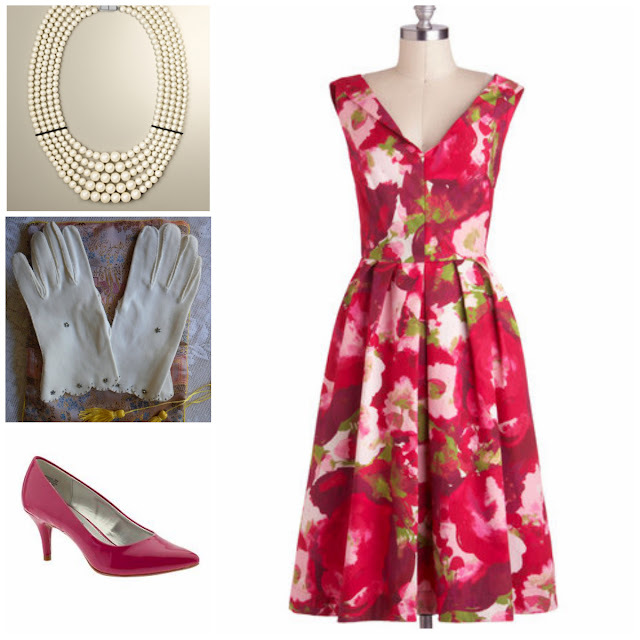 Now you're all set for hosting or attending a Mad Men Premiere Party for Season 6! Yay! And we can watch all of the re-runs we want and look at our pretty dresses for a few months. That'll chase away the winter blues, right? PS. Modcloth dresses like to go in and out of stock, so don't worry if one isn't available...chances are it will be back in stock by April! *Disclosure: This post contains some (not all) affiliate links. Oh I love Joan! But who would you be Natalie?! I seriously love that Peggy outfit! You are going to have to add the daughter in there soon, she is growing up! Claire that's such a good idea! what a fun post!! love mad men! Hi Anna! Me too :-) Popped over to your lovely blog and I think we should be friends!